"Brotherhood is the very price and condition of man's survival." Even only-child's grow up to learn the unity in brotherhood - and yes, this associates with the females, too - sometime in their lives. We are either born into it, or we adapt to it. Now, I ain't saying it's easy, hell, I ain't even gonna tell you it's a necessity, but it is a damn good thing to have through life. Assistance and friendship we will all need at some point in life. It's a tough world to live alone. There's always going to be someone there by your side. Will they help guide you? Or will they stab you in the back? 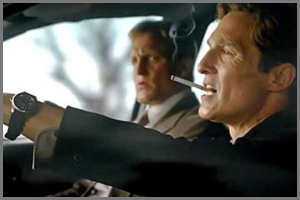 In this first edition of our television segment, I spotlight the relatively new show; True Detective. 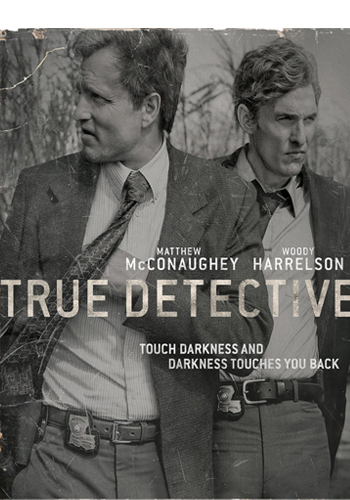 It stars Matthew McConaughey and Woody Harrelson as the roles of Detectives Rust Cohle and Martin Hart, respectively, who's lives become entangled during a 17-year hunt for a serial killer in Louisiana. This dark, vivid and intense show tells a narrative of both the past and present lives of each detective in the means to collide at a point later in the series of 8 episodes. The partnership of each detective also touches on this issues theme of Brotherhood. Their chemistry is a fragile one, but they know they have to stick together through all their hardships and the insanity they come across. Co-starring Michelle Monaghan, Michael Potts and Tory Kittles, this is a definite must-see for its intense story telling and horrific drama. It has a killer opening sequence too, as well as a hard hitting crime background that makes it feel authentic and unique. [7:50 PM] littlefinger entered the room. [7:51 PM] aphlix: How do. [7:51 PM] aphlix: How's it goin'? [7:52 PM] littlefinger: can you not clear chat ? [7:52 PM] aphlix: No need, it's more fun a read like this, hey alll! [7:52 PM] aphlix: Shall we jump right in? [7:53 PM] littlefinger: Going good thank you; yourself ? [7:53 PM] aphlix: Yeah I'm OK. ? [7:55 PM] aphlix: Have you played longer than he? Or vice versa? [7:57 PM] aphlix: You are still here, but, you and I and most of GN know there are some that preferred you weren't, can you elaborate on any problems they have caused you? [8:00 PM] aphlix: Have you had many attacks on your life this round? Can you give details? [8:02 PM] aphlix: Going back to the theme of the issue, you and Taranis seem to have a solid base hold up at the top. Have you seen any other partnerships this round which showed great teamwork? [8:05 PM] aphlix: Great. So would you say this round is the most successful you have been? [8:06 PM] aphlix: Not even next round? What can players expect from you next round? [8:08 PM] littlefinger: I am quite well known for committing suicide after about a month of my accounts so I will definitely be taking a break after this account... I do plan on playing next round I just don't know how long i will be gone. I would estimate I would be back between day 50-100... I look forward to not having to log in everyday and I have recently bought a PS4 so I look forward to playing that...but I also look forward to next round even though I know I may be targeted which I understand... I look forward to just enjoying the game as I wont have a family next round so I don't have to be on as much. [8:09 PM] aphlix: One final thing. [8:10 PM] aphlix: A smooth ride to the end, or people getting close and causing you a threat? [8:12 PM] aphlix: Okay, thank you very much. [8:12 PM] littlefinger: Thank you for having me. -- Two peanuts walk into a bar, and one was a salted. -- I went to a seafood disco last week... and pulled a mussel. agdgdgwngo is just a memory now for some. But it must be very different for you. Can you tell me about what that character meant to you? To be honest with you it seems very strange not being agdgdgwango, so many people wanted me to change the name because of it being so long but being someone who likes to have a laugh and a joke i thought it went very well. This next issue is themed upon brotherhood. Who would you say you are closest to here and what makes that friendship/teamwork work? As we all know my mate plays this (hell) he was the one to get me playing however i have met a few amazing players over this round and get on great with them and for me teamwork can only happen if you can joke about as well .For me its about having fun and if you can't have a laugh then there's no friendship for me. Where do you think you would be if you weren't in Surreal Consequences? That is a good question tbh i don't have a clue i prob would have started a family/joined hell but then again my fellow scum would of accepted me. Can you tell us about the events that occurred that played for the demise of your previous character? So what made you come back and stay? This issue has been viewed by 58 players and rated by 12 players.